In September of 1957, Dover AFB was tasked to support our ally King Hussein of Jordan against the threat from Syria’s leftist-ruled pro-Soviet army, by airlifting 40 jeeps equipped with 109mm recoilless anti-tank weapons to Amman. In the 1950s the arms race was in full swing. The Soviet Union was supplying Egypt and Syria with numerous weapons whereas Jordan, Iraq, Lebanon and Saudi Arabia were looking to the West for help. As a result, the United States began sending arms to Iraq, Turkey, Lebanon and Saudi Arabia. And when it was decided to send arms to Jordan, the 1607th Air Transport Wing was alerted to provide the transportation for operation Good Hope. So, by direction of Atlantic Division (ATLD) MATS, Dover would operate five trips in support of the mission. The missions would be assigned to the 1st, 15th, 20th, 31st and the 40th Air Transport Squadrons. The mission commander: Major Mathew “Joe” Freda, 1607th Air Transport Group. The cargo would consist of 40 jeeps totaling 42 tons. A total of six C-124 Globemaster IIs were used in the operation, five carrying cargo and one used as a spare. The proposed itinerary was as follows: Dover AFB to Earnest Harmon AFB, Newfoundland (refuel) and on to Lajes AB, Azores (crew rest). The next legs would be through Nouasseur AB, Morocco (refuel) and on to Wheelus AFB, Libya (crew rest). Then Khartoum, Sudan (refuel) on to Dhahran, Saudi Arabia (crew rest). Amman (offload) and back to Dhahran, (crew rest). Finally terminating the mission back at Wheelus with a crew rest and returning to Dover as channel traffic. So our crew from the 15th ATS, having been assigned the second trip was on its way departing Dover on September 2nd with enroute stops at Harmon, Lajes, Nouasseur and Wheelus. The operation was fairly routine until arrival at Wheelus, on the 4th, as there were several messages awaiting us concerning the operation. One message from ATLD advised us to proceed to Dhahran via Port Sudan versus Khartoum. This re-routing seemed impractical as Port Sudan’s longest runway was only 6,000 feet long and had no facilities other than 115/145 aviation fuel. Major Freda saw no reason not to use Khartoum as a refueling stop for the flight to Dhahran as Khartoum was a regular MATS stop. Other messages included one from the Air Force Attaché in Israel giving approval for rerouting, requested by Dover, to overfly Israel on the way to Amman. Another message from the Army Attaché in Amman suggested a mass flight to arrive on September 7th at noon and circle the city. On the following morning, the 5th, a message from MATS cancelled the rerouting over Israel and a message from ATLD instructed us to proceed as originally planned from Wheelus to Amman. Another concern faced us at Wheelus. The operation did not have diplomatic clearance for Jordan. The cancellation of the routing over Israel was due to the objection by the Jordanian government for flights over Israel entering Jordan. Finally it was concluded that Jordan would give us diplomatic clearance for this operation which was for its own benefit and only for specific routings. Wheelus was unable to give us much assistance in obtaining diplomatic clearance so the mission proceeded on to Dhahran following a 15 hour ground time at Wheelus. It was standard procedure for Wheelus to route flights to arrive at Khartoum for night take-offs due to high daytime temperatures exceeding well over 100°F. Take-off at Khartoum even at night limited our take-off gross weight to 179,000 pounds. However, at Khartoum, we were able to obtain a copy of BOAC’s ADF (Automatic Direction Finder) let-down plate, the only one known for Amman. Having arrived at Dhahran on the 7th, an ATLD message gave us instructions to hold there and to make a mass flight with a noon arrival over Amman on September 9th. In addition, the diplomatic clearance officer advised us that our flights did not have diplomatic clearance for Saudi Arabia even though we’re now on the ground in Saudi Arabia! Only MATS scheduled flights as published in the Monthly Operations Bulletin have blanket diplomatic clearance. He said that he would clear it for us, however. He further agreed to get us clearance across Saudi Arabia to the Jordan border. At this time it was pointed out that there was no message giving us diplomatic clearance for Jordan. Thus it was decided to send a request for confirmation to the Army Attaché at Amman. The clearance officer at Dhahran said he had been briefed by the Army Attaché at Amman that there were limited facilities for cryptographic decoding at Amman and that it was advisable to send messages unclassified if possible. An unclassified message was therefore sent to Amman with as much unclassified information as possible. After a weather briefing indicated that VFR (visual flight rules) weather could be expected along the route for the next several days, arrangements were made with Dhahran Flight Service and AACS (Airways and Air Communications Service) to handle this flight. Flight Service agreed to a VFR flight plan and further to hold a copy that was normally sent to Damascus FIR (Flight Information Region) until the approximate ETA (estimate time of arrival) of the flight to Amman. AACS also agreed to accept a position report, hourly, from the lead aircraft for the five aircraft in the flight along with an operations normal report on the half hour. The ETA for the destination would not be given. Individual clearances would be prepared for each aircraft but the lead aircraft would do all of the position reporting for the VFR flight. Finally a briefing for all of the crew members was held on the 8th. The importance of the mission was emphasized and all of the available route information, flight procedures and other pertinent information was passed along. Takeoff was set for the 9th and aircraft weights were restricted to 180,000 pounds due to high runway temperatures and the humidity. Takeoff was made at runway length intervals and a loose formation established. A couple of practice formation turns were made enroute but did not look that good. These turns caused the rear aircraft to use considerably more fuel trying to keep up. Navigators used their periscopic sextants to check the formation behind them to see how the formation was lining up and passed this information on to the pilots. The spacing between aircraft was stressed to be no closer than one aircraft height vertically in order that any aircraft could break formation if necessary without endangering itself or other aircraft. For a portion of the route, navigation was aided with the use of on-board radar picking up the returns of the Trans-Arabian pipeline running between Qaisumah, Saudi Arabia and Sidon, Lebanon. On nearing Amman the tower asked us to fly in the local area for approximately one hour. This was refused due to insufficient fuel. After landing, the tower wanted us to stop just off the runway with each aircraft parking behind the other and proceed to the ramp in echelon. Two 360 degree turns in echelon were made over the city of Amman. On the second turn the aircraft were spaced for the downwind leg for landing. As the first aircraft landed and taxied off of the runway, the second was crossing the fence and so on through the fifth aircraft. Observers on the ground remarked quite favorably on the brief airshow. 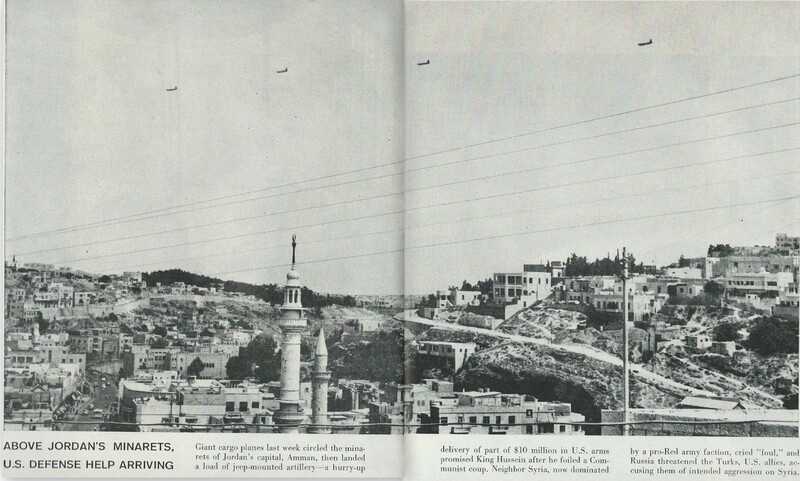 A photo of our flight over Amman appeared as a center spread in the September 23rd issue of Life magazine. Hosted by King Hussein’s representatives, we were invited to the Jordanian Officer and NCO clubs for lunch partaking of Jordan’s national dish Mansaf; sitting around a huge tray of lamb cooked in a sauce of fermented dried yogurt and served with rice including a cooked lamb’s head, with eyeballs, nestled in the middle. Following this very unique experience, we were again in the air winging our way back to Dhahran for crew rest and then on to Wheelus to pick up opportune cargo for our return to Dover. Ref: Post trip report by Major Mathew J. Freda, 1607th ATG, 17 September 1957.
reading about some of the more detailed aspects of the trip. If the museums C-124 cockpit is open sometime, I would like to see it again since I spent so much time there.